The agreement with Dartford and Gravesham NHS Trust was signed earlier this month. 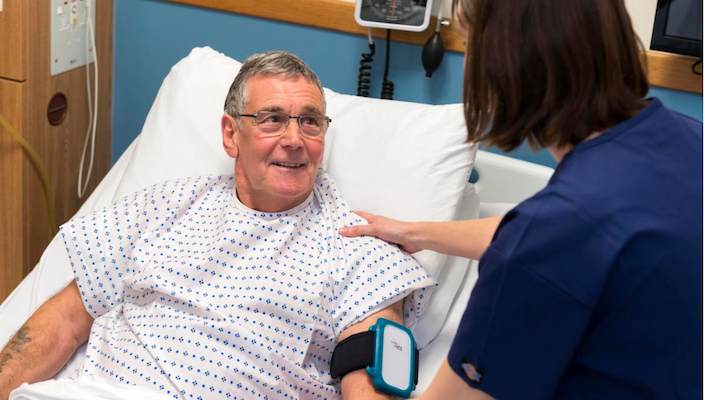 England's Dartford and Gravesham NHS Trust Hospital at Home team has reduced the number of home visits by 22 percent after deploying the AI-enabled wearable from Scottish start-up Current, formerly known as snap40, to monitor patients remotely after they are discharged from hospital. Current said the trust’s team, including nurses and physiotherapists, was trained to use the solution in less than an hour. Staff identify patients that can be managed at home and then link them to Current, receiving two wearables, a Homehub and a charger. They are instructed to plug in the Homehub to receive WiFi in their home and securely transmit data using a cellular network. The wearable, which is worn on the upper arm, collects vital signs continually with what the company describes as “ICU-level accuracy”. Its AI platform analyses data to offer insights about the user’s health, alerting staff when showing signs of deterioration through the Current mobile app that the Hospital at Home team has access to. The agreement between Current and the trust was signed in early January, and the initial plan was to focus on patients with respiratory disease, but it was soon expanded to all those within the service. McCann announced in July last year that the company had closed an $8m seed funding round led by ADV, with participation from MMC Ventures and other private investors. The company rebranded as Current earlier this month.